This lovely dish is full of Moroccan spices and tender vegetables. It is quick and easy to make and makes for the perfect dinner. It is hearty, vegan-friendly and warms up great the next day. 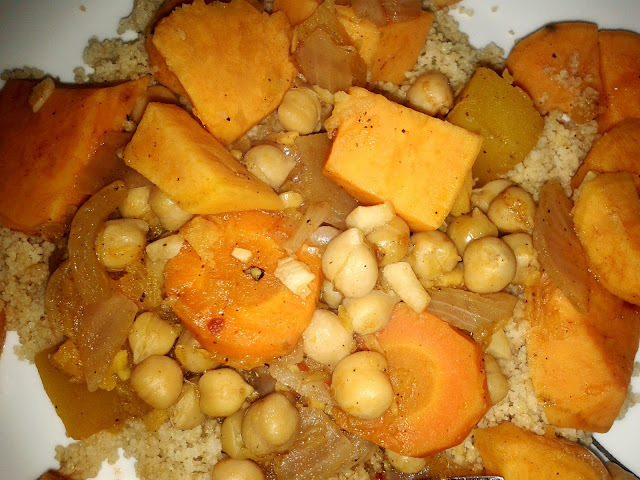 A must make recipe if you enjoy sweet potatoes, butternut squash, and chickpeas. Heat the oil in a large pot over medium heat. Add the onions and cook until soft, about 10 minutes. Add the cumin, coriander, crushed red pepper, cinnamon, garlic, and tomato paste; cook for a minute or two until fragrant. Add the squash, sweet potato, carrots and toss well to coat. Pour 2 cups of the stock and the lemon juice over the vegetables and bring to a boil and then a gentle simmer. Cook partially covered over a low heat for about 30 minutes until the vegetables are tender. Season with salt and pepper. Add the chickpeas and simmer for an additional 5 to 10 minutes. Meanwhile, cook the couscous according to package. Either with boiling water or boiling vegetable broth for more flavour. Spoon vegetables and sauce over warm couscous and serve! Looks like a nice recipe to use up some root vegetables! This sounds like my kind of meal! 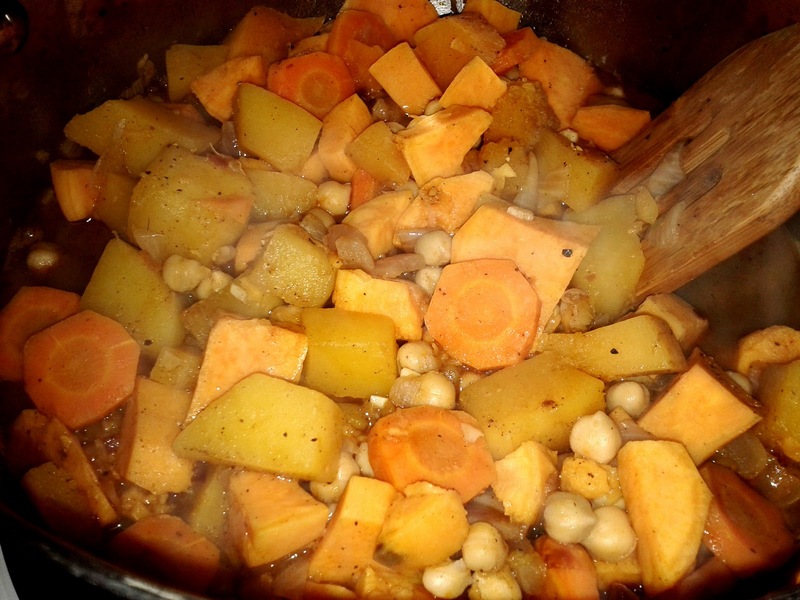 I just love the combination of spices and sweet potatoes, butternut squash, and chickpeas. What a fun, beautiful recipe! I love the warm colors! Yummy! I studied abroad for a semester and when I was in Morocco, we ate tagines for almost every meal. Love it! This looks and sounds wonderful - a perfect autumn dish! Oh I love cooking in tagines! This looks so good! This looks just like one of my favorite dishes that we serve at the restaurant! The recipe is a secret, prepared by only one person, so I've been dying to figure it out. Thank you for a very solid starting place! Love these types of dishes! so warm and comforting to the soul. Hi Natalie, this looks very healthy, must try it soon. :) Thanks. Yum. I like all the ingredients in this! Great recipe! I used to live in Morocco - and I absolutely love the flavors. It's amazing how well cinnamon goes with hot chiles. Thanks!